According to the American Heart Association Journal, meditation has been part of human societies in various forms for thousands of years. The optimal manner to categorize the myriad techniques is open to opinion. It should be emphasized that their origins typically relate to endeavors to improve awareness or consciousness and have little to do with the treatment of hypertension. In the limited context of this review, we have divided practices into focused attention (ie, mantra and training awareness) for example Zen, pranayama, and mindfulness meditation. As yogis have known for centuries—and as medical science is beginning to discover—the breath has amazing recuperative powers. By controlling the breath (a practice called Pranayama), the yogis found, they could alter their state of mind. How does slower breathing help? In stressful times, we typically breathe too rapidly. This leads to a buildup of oxygen in the bloodstream and a corresponding decrease in the relative amount of carbon dioxide, which in turn upsets the ideal acid-alkaline balance — the PH level — of the blood. This condition, known as respiratory alkalosis, can result in muscle twitching, nausea, irritability, lightheadedness, confusion, and anxiety. In contrast, slowing the breath raises the carbon dioxide level in the blood, which nudges the pH level back to a less alkaline state. As the blood’s pH changes, the parasympathetic nervous system calms us in a variety of ways, including telling the vagus nerve to secrete acetylcholine, a substance that lowers the heart rate. As with any treatment, the breathing remedy must be administered intelligently and judiciously to be fully effective. Each condition responds best to its own special breath. To calm anxiety, for example, you can purposely lengthen your exhalations. Unaided breathing techniques, such as Zen meditation & pranayama, require training and concentration, whether it is counting breaths or focusing on the breathing sensation. Trying to prolong the exhalation on your own requires conscious “decision making” process which elevates the sympathetic nervous system activity and therefore is less optimal for lowering blood pressure. Pranayama breathing usually requires concentration and training. For some people, it is a journey and it takes time, effort, and concentration. If you want your breath to work as an extra-strength remedy, it’s a good idea to do some preliminary practice before you try to apply these techniques. First, spend some time with your breath when you’re feeling in the pink, learning to closely watch its movements and tendencies. Breathing is part of the autonomic nervous system, which is comprised of the sympathetic and parasympathetic nervous systems. In general, the sympathetic nervous system is responsible for governing our responses to stimuli, deciding whether they are threatening, and tripping the signals that tell the body how to react. This is sometimes described as fight or flight responses. The parasympathetic nervous system helps the body calm back down after the danger or stressor has passed. One of the things that the sympathetic nervous system effects is the breath. In the presence of real danger, the breath becomes fast and short as your body tries to load itself with oxygen to facilitate its escape. This kind of breathing is also a response to non-life-threatening stressors. It happens in response to panic and then perpetuates the panic. If we’re aware of this, we can deliberately slow and deepen the breath, by signaling the body that it’s ok to calm down. Your breath is a powerful force you can use to control your body’s responses to stress. Three-Part Breath – Dirga Pranayama A good breathing exercise for beginners. Doing three-part breath teaches you how to fill and empty the lungs completely, which is important because you’re probably not used to using your full lung capacity. It’s also a nice way to transition into your yoga session. Equal Breathing – Sama Vritti Pranayama Taking long, deep, slow breaths has a relaxing effect on the body. Bringing your full attention to keeping your inhalations and exhalations the same length occupies your mind, giving it a much need break from its usual hum of activity. Alternate Nostril Breathing – Nadi SodhanaIn nadi sodhana, you block off one nostril, exhaling and inhaling through the open passageway before switching sides. This helps bring you into balance by clearing the energy channels on both sides of the body. Before starting your meditation, you need to find a quiet and peaceful place where you will not be disturbed. The room where you will practice in should not be too dark or too bright, too warm or too cold. There are different ways that you can practice Zen meditation. Traditionally, only the full lotus position or the half lotus position is used. If you lack flexibility, it is also possible, yet least recommended, to practice Zazen kneeling or to sit on a chair. Zazen is practiced sitting on a zafu, a thick and round cushion, in the full lotus (Kekkafuza in Japanese) or half-lotus position (Hankafuza in Japanese). The purpose of this cushion is to elevate the hips, thus forcing the knees to be firmly rooted to the floor. This way, your Zazen will be a lot more stable and also comfortable. Additionally, you need to have a zabuton, which is a rectangular mat that is placed under the zafu to cushion the knees and legs. Whatever the position you choose to adopt, make sure that your back and neck stay as straight as possible. Pull your chin in a little to erect the neck and try to “push the sky” with the top of your head. Do not be too tensed or too relaxed while you do this; try to find balance in your posture. Keep your mouth closed during zazen; your teeth should be together, and your tongue should be against the roof of your mouth just behind your teeth. Traditionally in Zen, the eyes are kept open during meditation. This prevents the meditator from daydreaming or becoming drowsy. Without focusing on nothing in particular, direct your vision about one meter in front of you on the floor. Your eyes will naturally come to rest in a position that is half opened and half closed. When doing zazen in a soto dojo (meditation hall), the meditator sit facing a wall in order to avoid distracted by external movement. It is suggested to do the same at home. The position of the hands during Zazen is the same for the full lotus, half lotus, seiza and chair positions. This hand position is called the Cosmic Mudra or Hokkaijoin in Japanese. First, put your left hand on the right one, and palms turned towards the sky. Now, make an oval by touching the tips of the thumbs together so that your thumbs touch each other and form a somewhat straight line. The tips of your thumbs should lightly touch each other. Both of your wrists should rest on your thighs; the edge of your hands should rest against your belly. Keep your shoulders relaxed. As with breathing, the mindset is essential in the practice of Zen meditation. The right state of mind emerges naturally from a deep concentration on the posture and breathing. During zazen, it is normal to have images, thoughts and emotions coming up to the surface, appearing from the unconscious mind. Do not pursue them or fight escape from them. The more you try to get rid of them, the more attention you give them, and the stronger they become. Try not to attach to them. Just let them go without judgement, like clouds in the sky. Zen breathing cannot be compared with any other, and it is a fundamental part of the Zazen practice. The correct breathing can only be achieved through the right posture. During Zazen, breathe quietly through the nose and keep the mouth closed. Try to establish a calm, long and deep natural rhythm. You should focus on exhalation while inhalation is done naturally. Zen breathing and martial arts breathing are similar, and they can be compared to the mooing of a cow or the roaring of a tiger. Whether you are a practitioner of Zazen, Pranayama Yogic Breathing, or Transcendental Meditation, we laud you. These practices have been time tested and proven to be an immense health benefit for those who practice these various meditations. RESPeRATE acts as your personal coach to lead you to perform the therapeutic breathing exercise subliminally, without any effort. RESPeRATE technology takes advantage of the human body’s natural tendency to follow external rhythms and a patented interactive “feedforward” concept. The technology composes rhythmic guiding tones, in real time, while measuring the user’s individual respiration pattern. By dynamically manipulating and recalculating these personalized tones it guides users into a Therapeutic Zone, with almost no conscious effort on the user’s part leading to unprecedented efficacy, ease-of-use, and compliance. RESPeRATE is a combination of “Ancient Wisdom” with “New technology”. RESPeRATE is highly effective in lowering BP since it actually combines both the ancient wisdom of pranayama breathing and a patented technological twist of biofeedback called feedforward. 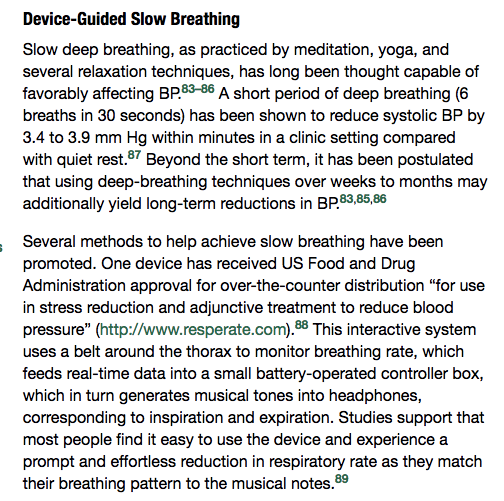 RESPeRATE’s patented “Device-Guided Breathing” taps the body’s natural tendency to follow musical rhythms. RESPeRATE analyses the breathing pattern and composes, in real time, a personalized melody with two distinct inhale and exhale guiding tones. By gradually prolonging the exhalation tone, RESPeRATE leads the patient to the therapeutic zone of 5-6 breaths per minutes with prolonged exhalation guiding tones. After each session of device-guided breathing, respiration returns to normal, but the beneficial impact on blood pressure accumulates and is maintained with routine use. RESPeRATE works by reducing sympathetic neural activity and creating a sustained decrease in peripheral resistance and arterial stiffness. Both RESPeRATE and pranayama are based on slow breathing with prolonged exhalation. Conscious breathing is a choice that prompts conscious awareness. Choosing to breathe with no pauses in a connected way, propels an increase of awareness within the body’s physical, energetic, and perceptual systems, and inspires an increased interchange between a person’s conscious and subconscious mind. But with RESPeRATE we have created a device that will allow you to do this effortlessly. Finally, I want to remind you that the American Heart Association (AHA) a very conservative medical group found RESPeRATE to be the #1 most effective non-drug method after diet and exercise: Taken from Hypertension Journal. Click here to read the full article. Best Blood Pressure Monitor – why to buy one and how to choose it? Smart Smoothies When You Have High Cholesterol. Here are smoothie recipes to help lower your cholesterol and relieve the unnecessary burden our hearts have to carry. I need to leran how to lower and stablize my BP. I'm open to alternatives to drugs. Learning to lower your blood pressure without medication is what many people are trying to do. I applaud you in you endeavor. With lifestyle modifications and the use of RESPeRATE I was able to go from 189/109 to 120/60. It wasn't easy but worth the effort. I applaud your endeavor. For me it started with lifestyle modification and RESPeRATE. My medication has been cut in half so far. Hopefully med free soon. I have been considering purchasing the resperate for quite some time. I have been experiencing anxiety especially when I take my blood pressure readings at home or at the doctor's office. I do deep breathing exercises like the 4-7-8 technique. I am also am experiencing insomnia. Will Resperte help me slow down my breathing especially while taking my bp? This past week I spoke with one of our users who told me that it has helped with her "White Coat Syndrome" and that she sleeps much better at night. Many of our users will use RESPeRATE just before bedtime and report getting a great nights sleep. RESPeRATE was note only approved for the use is lowering high blood pressure but also stress by the FDA. We also have clients who do not have high blood pressure who have purchased the device for anxiety disorders. With its 60 day money back guarantee, you can't go wrong. Thank you for sharing this informative & really needed transcendental meditation inforamtion. Dear Enrico, Vey glad that you enjoyed the article. Hope it will be possible.